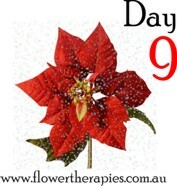 On the ninth day of Christmas, Australian Bush Flower Essences gave to me… Bush Gardenia (Gardenia megasperma). Have you ever wondered how you can take better care of your loved ones and all your relationships at Christmas? Well there is an easy answer, and that is to take better care of yourself! While it may seem paradoxical to take care of yourself before extending yourself to others, if you don’t do this, you will have nothing to offer anyone else. One of the main things Bush Gardenia Essence can help you with is better nurturing your intimate relationships, and part of its effect can be to inspire you to get better at nurturing yourself first. The Christmas season provides you with a good barometer to measure your relationships against: if you find yourself joyously doing the little things to make Christmas bright for your loved ones, then your relationships are flying high; if you find it a struggle to stretch yourself to do anything for your loved ones, then maybe it’s time to inject some Bush Gardenia Essence into your relationships. Enjoying the ‘scents’ of the season: Many countries have their classical Christmas scents, but one of my favourites here in Australia is when the gardenia flowers absolutely take over the airwaves! For me and my family, it heralds the start of summer and the Christmas season, and reminds me of wonderful times spent with loved ones. Bush Gardenia Essence can help you to better enjoy the beauty of the festive season and really appreciate the joys and wonders that often go unnoticed. One of the ways you will start to notice the things that are wonderful in your own life is to take time to stop and smell the flowers (gardenias or otherwise!) and this Essence can help you to sit back, soak in the smells and sounds around you and really appreciate the little things. Self nurturing = better relationships: If improving your personal relationships is at the top of your agenda, then Christmas seems like it would be the best time to do this, don’t you think? And as I said earlier, to maintain wonderful relationships, your own self-nurturance needs to have your ‘cup overflowing’ with much self-love, respect, kindness, goodwill and gratitude – so much so that you truly want to pass on some of your excess gifts to your loved ones. Bush Gardenia Essence can help you to take better care of yourself physically, emotionally and spiritually so that you then want to put your heart and soul into your intimate relationships. In contrast, not nurturing yourself means that you are more likely to become a ‘Scrooge’ when it comes to sharing yourself with your partner and putting your time into your relationships. Seeking the beauty in less joyous situations: Sometimes you can be faced with situations at Christmas which are uncomfortable, unenjoyable and seemingly unavoidable. But within these types of situations often lies the opportunity to learn more about ourselves, to better deal with others and if nothing else, to build upon our own levels of patience and allowance! Bush Gardenia Essence can help you to find the beauty that really seems well hidden in difficult or awkward situations during the festive season, and as a result can enable you to feel better about everything around you, but also can help you to take back your power when it comes to situations that appear to be out of your hands. One of the best ways to embrace Christmas is fully nurtured, with a lot of heart and feeling sensuously alive with possibility, so try some Bush Gardenia Essence and watch your relationships come alive this festive season! Don’t forget to tune in again tomorrow and make sure you don’t miss out on any of the Essences by subscribing to my blog here. Lovable Post! Australian Bush Flower Essences, Just a drop under the tongue or a thin cover of cream on your skin and you’re up for it! The supportive use of natural flower essences is a great one for creative in the limelight. Thanks so much for your input – glad you liked the post!